A growing body of research has been performed on concrete’s thermal performance, investigating the potential of annual energy savings. However, the percentage of energy impact of thermal mass is highly dependent on the local climate. Energy efficiency and material efficiency go hand in hand with precast concrete. Precast concrete inherently resists natural forces with a totally composite and fully insulated building system that is scalable to specification. A precast concrete building is enclosed as the structure is being erected, thereby limiting the ingress of moisture and mold. Precast concrete additionally provides efficiency in its use of materials, both throughout the construction stage and during the operation of the building. The hard-finished surfaces are easy to maintain. Produced off-site to meet the precise demands of the job, precast brings these additional performance attributes to the table: site efficiency, minimal site disturbance, negligible waste, low life-cycle cost, operational efficiency, computer-aided or assisted design, and risk reduction for trades. The industry is currently working on research with the U.S. Department of Energy (DOE) to further improve precast wall panels’ energy performance. Previous studies have shown that a major source of air leakage in a building is through the walls and envelope; the DOE has identified precast concrete wall systems as an optimal solution for achieving high levels of energy efficiency because air leakage through a precast insulated wall panel is negligible. However, erection and treatment of the joints to eliminate thermal bridges can be critical issues. The industry also is working to bring down the weights of precast insulated wall panel and envelope systems, while reducing the weight and decreasing the thickness of the precast layers within the concrete sandwich panel assembly. Part of the goal of the project is to use high-performance concrete (HPC), which is a different mix design that increases the strength of the concrete through additives while reducing the weight, decreasing the concrete sandwich panels’ thickness. HPC also uses less portland cement, which decreases the embodied energy and, therefore, the panel manufacturing process’s environmental impact. 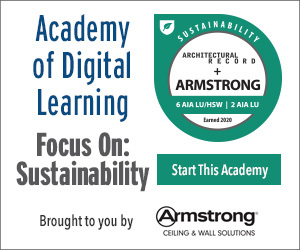 A majority—95 percent—of a building’s energy and environmental impact occurs over the life of the building versus during the manufacturing process. Insulated precast wall panels made of HPC offer a final building solution that reduces a building’s energy consumption over its life right from the beginning during the production process. 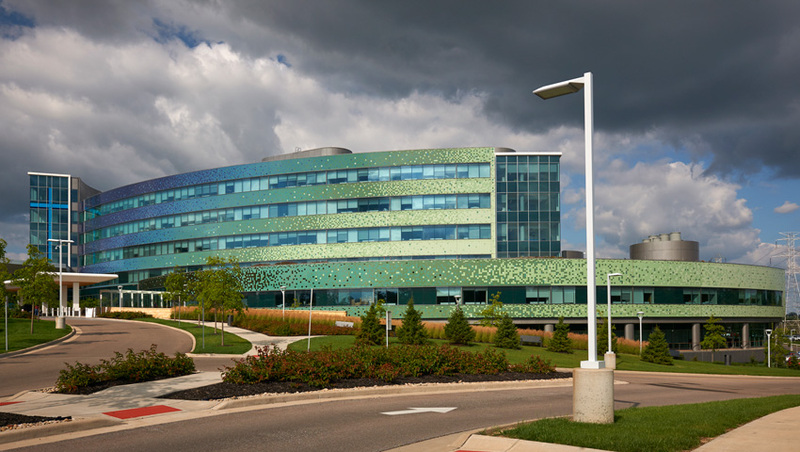 Inspired by Ohio’s tradition of pottery production, the new Mercy Health – West Hospital in Cincinnati is clad with thin-brick veneer embellished with thousands of blue and green tiles. Engineer of Record: THP Ltd. The total project cost was $200 million. The goal was to design and build a six-story, 645,000-square-foot hospital clad in colorful glazed tiles on a thin-brick veneer. Insulated precast concrete sandwich wall panels feature two prestressed solid concrete wythes with steel and wire-mesh reinforcement. The new state-of-the-art Mercy Health – West Hospital in Cincinnati would become a centerpiece for the health-care center, replacing another aging facility within the network. The owners wanted a design that was both beautiful and high performing, and designers turned to precast concrete to make that happen. To meet the client’s energy-efficiency goals, the designer chose a unique, insulated sandwich panel design that contributes to the overall energy efficiency of the building, while the radiused wall systems allowed versatility of shape for the structure. The insulated sandwich panels feature two solid concrete wythes that are both prestressed and also have steel and wire-mesh reinforcement. “By nature, these steel-reinforced concrete wall panels cannot be matched for durability and structural integrity,” says Glenn Ebersole, PE, market development manager of High Concrete Group, the precaster on the project. The facade of the building was inspired by Ohio’s tradition of pottery production. It is clad with a thin-brick veneer in a series of radiused wall panels and spandrels that were then embellished with thousands of tiles in 12 shades of blue and green in 19 different shapes laid out in pixel pattern. Using thin brick in the precast concrete panels significantly reduced the overall project timetable by enabling the tiles to be laid during manufacturing, rather than hand-setting them in the field. The veneer was also glazed to blend with the design. Along with offering a beautiful facade, the use of precast concrete brought several additional benefits to the building, including versatility of design, accelerated construction time, improved thermal performance, reduced long-term life-cycle costs, and increased fire and storm resistance to the structure. The result is a beautiful, durable structure that met all of the owner’s goals. “This project showcases the high-performance attributes of precast concrete in a variety of ways,” Ebersole says. A resilient structure is one that can withstand whatever natural or man-made disasters life throws at it. To be considered truly resilient, a building’s design and materials must comprehend structural durability; a long service life; functional resilience; multihazard protection; storm, blast, and earthquake resistance; life safety and health measures; passive fire resistance; and satisfaction of applicable FEMA guidelines. Resilient design is multifaceted and involves long-term thinking about worst-case scenarios as well as more common, everyday wear. The variables that contribute to resilience are complicated, but the big picture is simple: buildings need to be resilient in order to be truly sustainable. A precast concrete building can be both a beautiful and durable structure. 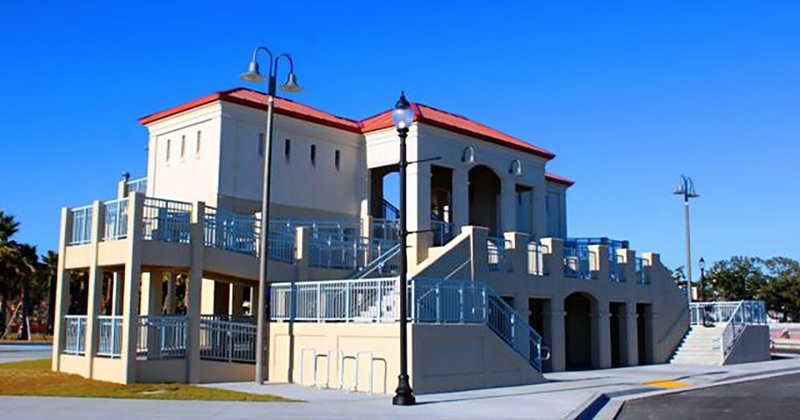 At the Coast Transit Authority Beach Comfort Stations in Biloxi, Mississippi, an all-precast concrete solution helped meet challenging design requirements while providing a functional and attractive building for the beach-going public. The precast structures withstand 200-mph winds and the high loads resulting from storm surge. Using a total-precast structure gave the team the ability to avoid maintenance on a regular basis due to the precast concrete’s durability.